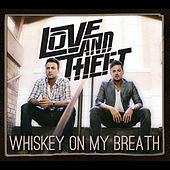 Love and Theft's breezy sound is amplified by seamless harmonies and jangling guitars, both of which are amply employed on their third album, Whiskey On My Breath. On upbeat songs like "Can't Wait for the Weekend" and "Easy," the harmonies invite you in to their good time; they can even make "Hang Out Hungover" sound like an appealing proposition. However, it's the somber songs, like the beautifully written title track, where Love & Theft show their mettle. Other highlights include the feel-good "Can't Stop Smiling," the beachy "Tan Lines" and "Wrong Baby Wrong," which Martina McBride took to the charts in 2009.